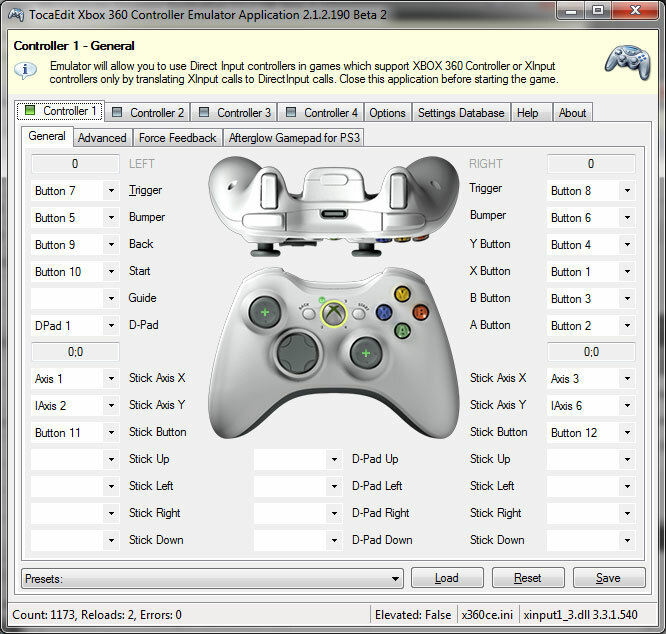 Although this has been documented elsewhere (see here and here), the instructions are mostly geared towards people who want to use a gamepad for one player and a keyboard/mouse for another player. 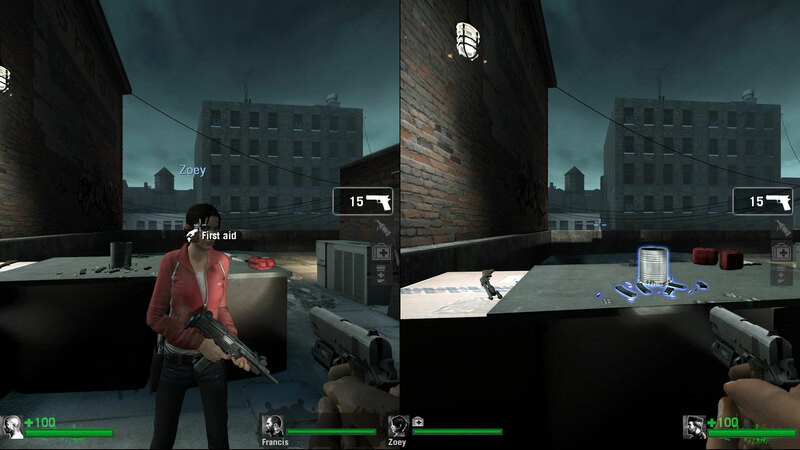 If you are fortunate enough to have two gamepads for your PC, then playing Left 4 Dead in split screen mode is surprisingly easy to set up. Step 2: Extract the zip archive to your Left 4 Dead executable directory, which will be something like C:\Program Files (x86)\Steam\steamapps\common\left 4 dead. Step 3: Run the x360ce executable file. When the program launches, it will prompt you to create the x360ce.ini file. This is the file that holds the configuration settings for the program. It will also prompt you to create the xinput1_3.dll file. This is the library file that gets compiled along with the configuration settings and will enable your gamepad to work with the game. Click Yes on both of these prompts to create the files. Step 4: At this point, you should be looking at a new window that says “New Device Detected.” Leave the first radio button checked – the one that says “Search automatically for settings” – along with the checkbox that says “Search the Internet” and click “Next” at the bottom of the window. Finally, click Finish at the bottom of the next window to import the settings. If the program displays a green box on the tab for the controller you have selected, then you can continue to step 5. If it displays a red box on the tab, then see the troubleshooting section below. If you’re using two gamepads, repeat this step for the second one. Step 5: Click Save at the bottom-right corner of the window and close the program. Step 6: Go to your Left 4 Dead bin directory, which will be something like C:\Program Files (x86)\Steam\steamapps\common\left 4 dead\bin. Rename the xinput1_3.dll file to xinput1_3.dll.old. Step 7: Launch the game. Click on Options, then on Keyboard/Mouse. Make sure “Allow Developer Console” and “Gamepad” are both enabled. Then click Done. Replace mapname with the actual name of a map. Auto-completion in the console should help you out here. When you’re done using a controller and want to use your keyboard/mouse again, go back into Options, Keyboard/Mouse, and disable the gamepad. What if x360ce doesn’t recognize my gamepad? At this point, you should be able to push the buttons on your controller and see the corresponding buttons light up in the diagram on the controller tab. This will tell you for sure if your gamepad settings are working. Do the same for the joysticks to make sure those are working too. If everything checks out, then you can resume from step 5 above. This entry was posted in Co-operative, Controllers, Gamepads, Games, Left 4 Dead, Left 4 Dead 2, Split screen on March 10, 2013 by Dave. Hey how do you change the sensitivity for player 2? Please help! can i use dualshock controllers? I would assume so. Like I said, I use a PS3 Afterglow. You might need a bluetooth adapter. I’m still having trouble setting my controller to player 2. I’ve looked at the links you gave Belmoth, but the information doesn’t appear current, or I’m simply missing something. Across the top, there are tabs for four controllers. There is a green box on the tab for controller one, meaning that controller is detected and configured. It could still be configured incorrectly (meaning the wrong config file was loaded for that controller – see above) but normally green is good. If you have a second controller that is also detected and configured, the tab for controller two would also display a green box. A red box means the controller is detected but it is not configured, and no box means it is not detected. I have no idea if that will actually work. I also thought there was a way to re-assign a controller to player two through Windows (possibly via the “Set up USB game controllers” applet in the Control Panel) but I could be wrong about that too. I have no way of trying it right now unfortunately. Thanks, after messing with a few other configs that didn’t work out too well this one worked perfect in a the 1.5 minutes it took to set up! Rock on! it doesn`t work…the gamepad works only for player 1 but nothing for player 2 .-. See what I said in this comment. There’s also a lot of discussion happening on this post. hello there!im having a problem here.i am trying to play splitscreen but the 1st player (1 controller) cant shoot,jumb,and reload.the 2nd one works perfect but the 1st cant do they above.also the 1st one works with the keyboard and mouse too but i want to play with the controller.Any help would be much appreciated.thanks! When you press the buttons on your controller, does each one light up in the diagram? If not, try importing a different configuration under Global Settings on the Settings Database tab. You’ll have to be more specific. Make sure you followed all the instructions. And clean out your computer. Can you be more specific? Did you use the same version I did? Maybe try a newer one. Something has probably changed since I wrote this article. shotting and pick up items dont work,jump dont work,sitting dont work and work walking and lokking arround please help! If you can walk and look around, it sounds like just the button configuration is messed up. Try experimenting with other configurations.